Test your knowledge and raise money for a good cause at the same time. 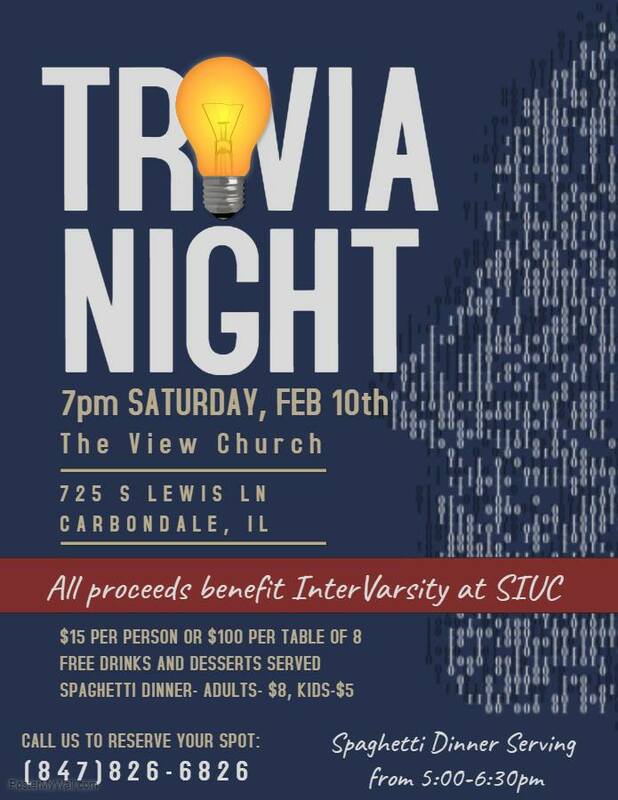 IV Trivia Night 2018 is raising money for the local SIUC chapter of InterVarsity Christian Fellowship to send students to Chapter Focus Week. Trivia Begins at 7:00pm sharp! Doors open at 5pm. Trivia Night Tickets - $100/Table of 8 --or-- $15.00/person if registering as an individual. Silent Raffle prizes are also available and winners will be drawn throughout the evening. Tickets for the silent raffle are available for $1 for 1 ticket, $5 for 6 tickets, $10 for 15 tickets, and $20 for 40 tickets.